It just wouldn’t be a Strange Music VIP experience without Brotha Lynch Hung. The exclusive VIP package for Tech N9ne’s All 6’s And 7’s Tour now includes Brotha Lynch Hung’s latest release, Coathanga Strangla. The album is included along with tons of exclusive merchandise valued at over $300! This is a perfect combination for fans who may have missed out on purchasing Coathanga Strangla. VIP packages for Tech’s All 6’s And 7’s Tour are now available, don’t miss out on this great deal! 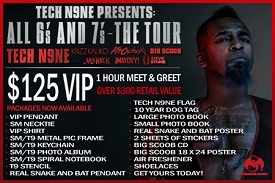 Click here to purchase a VIP package to Tech N9ne’s All 6’s And 7’s Tour.